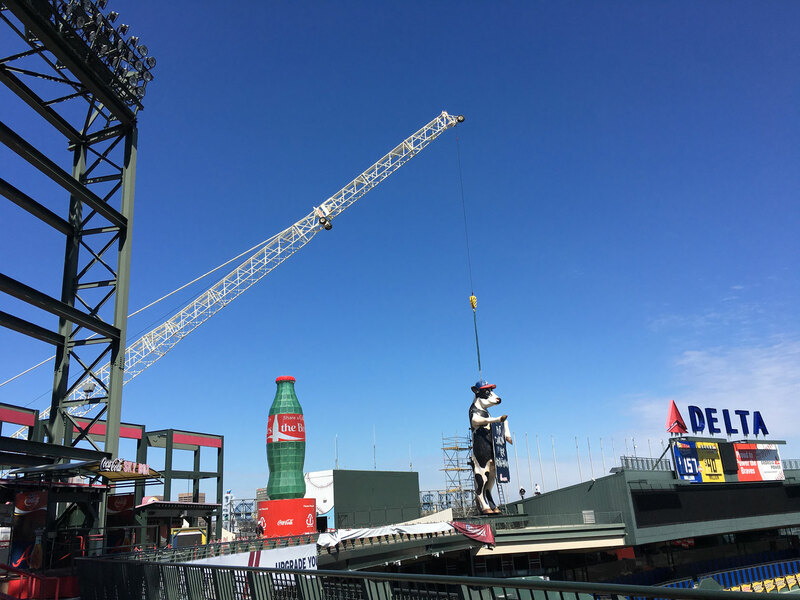 The Chick-fil-A Cow says was lifted by crane from Turner Field to prepare for its new home in SunTrust Park. To Atlantans and Braves fans all over the country, the tomahawk-chopping mascot was simply known as “The Chick-fil-A Cow,” and became a staple of Turner Field and Braves baseball since its arrival in 2008. After each big play, the Cow performed the traditional tomahawk chop along with the crowd. When third baseman Chipper Jones – one of the greatest switch-hitters in baseball history – retired in 2012, the Cow waved goodbye alongside other Braves faithful. And, while fans see the Cow as an extension of the team, many may not know how or why it actually got there. According to Daniel Perry, it all started with a group of local Chick-fil-A franchise owners (Perry included) who wanted to celebrate the town and neighbors they love. With that, the big (four stories to be exact!) idea was born, and every Atlanta-area restaurant owner chipped in to bring it to life. Because baseball fans love statistics, eight years of home games means the Cow saw 615 games, 5,673 innings, 530 Braves home runs and 347 Braves regular-season wins at Turner Field. So when the Braves decided to make the move to SunTrust Park, they knew the Cow had to move, too. But to do that, the Cow was going to need a bit of a... makeover. So where does one take a 36,000-pound cow for a makeover? For Perry and his team, the answer was obvious: Kern Studios. That’s because the New Orleans-based company has been building oversized cows for Chick-fil-A for the last decade. “If you’ve ever driven down the highway and seen a cow hanging off a Chick-fil-A billboard, that was us,” says Barry Kern, president and CEO of Kern Studios. But Kern isn’t just in the oversized cow business – his family has been making floats, props, sculptures and everything in between for the last 84 years. The family-owned company began in 1932 when Roy Kern built his first Mardis Gras float on the back of a mule-drawn garbage wagon, and business has been growing ever since. 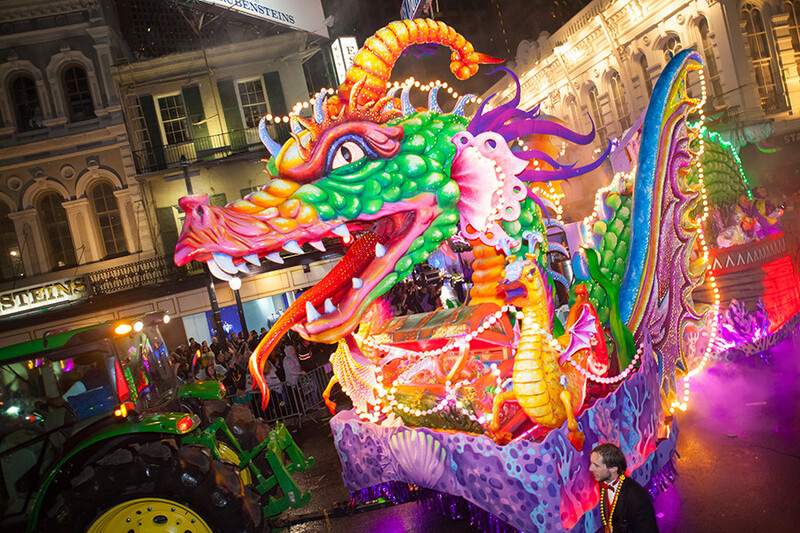 Kern Studios is now one of the biggest producers of Mardis Gras floats in the country. A Mardi Gras float crafted by Kern Studios, one of the largest float producers of the iconic festival. “This project was unlike any other we’ve done,” Kern says. That’s because they only had 90 days to take the four-story Cow out of Turner Field, transport it to New Orleans, rebuild it to fit into the new stadium, transport it back to Atlanta and install it at SunTrust Park. Ten thousand man hours later, it was obvious they did. When fans flood the field at SunTrust Park this spring, they’ll probably notice that the Cow has changed a bit since his days at Turner Field. 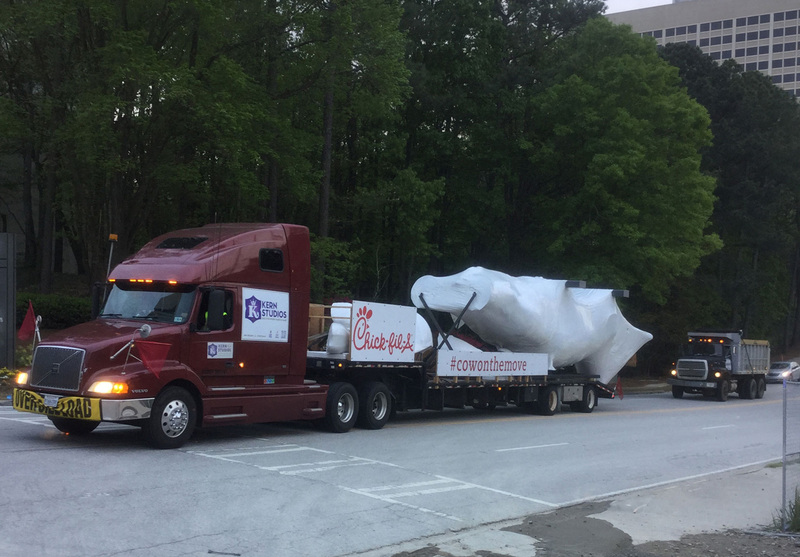 The Chick-fil-A Cow makes its trek back to Atlanta from Kern Studios in New Orleans. For starters, the Cow is a little trimmer – 18,000 pounds lighter, in fact. In order to raise the Cow up so it can be seen over the park, they had to put it on a bit of a diet, ultimately cutting its weight in half. One of the easiest differences to spot will be a giant LED sign board that will display updates about the game, fan messages and more. 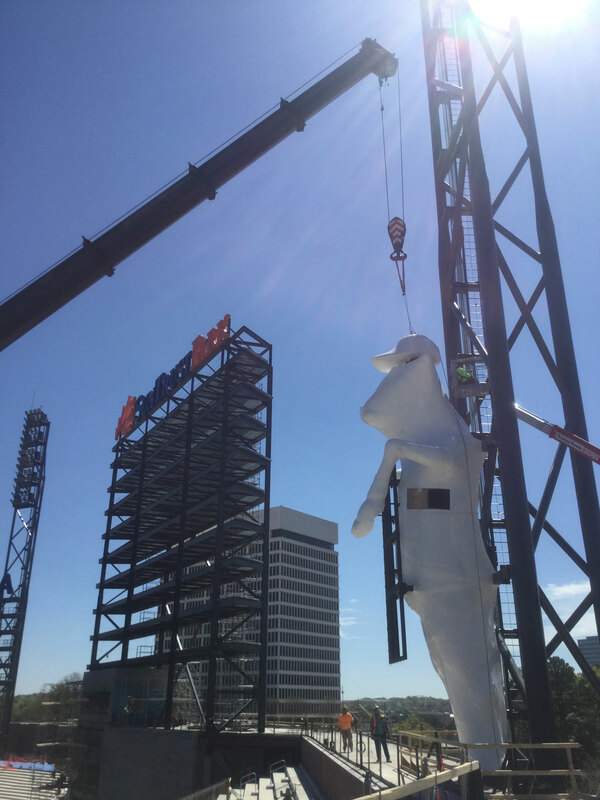 And unlike the Cow at Turner Field that was unreachable by the public, the new and improved Cow will be positioned along the right-center field walkway. This means that, for the first time, fans will be able to walk right up and pose for pictures in front of the iconic mascot. “It’s going to be a really incredible experience,” said Perry. But for Perry and his team of Atlanta Chick-fil-A restaurant owners, one of the best things about the new Cow isn’t new at all – it’s simply the fact that they can continue a tradition that’s become synonymous with Braves baseball. Logan Shore is enjoying a beautiful afternoon in Mesa, Ariz. It’s sunny and 75 degrees— weather the 22-year-old Minnesota native is not used to seeing in February, but will gladly take. It’s a surreal moment for Shore. It’s a day he has thought about for months. And it all started with a phone call last June.